Those of us at MB Golf would like to thank everyone for a fabulous year of Myrtle Beach golf. We look forward to seeing you on the courses in the new year. We wish everyone a very happy and prosperous 2012! Please be safe while out celebrating with friends and family. Different places have different ways of welcoming the New Year in, each having a stamp of its own culture. Whether you’re in Myrtle Beach for the Myrtle Beach golf or you’re here on vacation or visiting family, you can count on plenty of New Year’s Eve celebrations taking place around you. 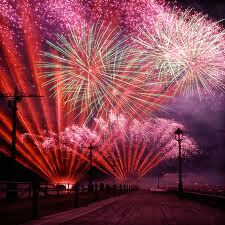 The New Year’s Eve festivities around the Grand Strand are famous for fireworks up and down the 60 miles of coastline. As the sun goes down on the last day of 2011, the Grand Strand begins to fill with people to watch the fireworks. Tourists from all over come to the beaches on New Year’s Eve to experience the excitement first hand and take back home the spirit of the celebration. New Year’s Eve Fireworks at Barefoot Landing on Saturday, December 31, 2011 6-10 p.m. Come to Barefoot Landing to ring in the new year by having dinner and enjoying a fabulous fireworks display at 6:00 p.m. over the lake! Hard Rock Cafe New Year’s Eve Bash is December 31st from 10:00 p.m. to 2:00 a.m. There will be music and plenty of dancing as Black Glass plays the whole night through. Confetti Cannons, the Grand Strand’s Largest Balloon Drop and a champagne toast will jump start you into 2012! Tickets are $25 and available at Hard Rock or by calling 843-946-0007 ext. 208. Tickets include a light buffet, dessert station, party favors, a champagne toast and more. New Years Eve with Corey Smith, Sunny Ledford and American Aquarium at House of Blues in Myrtle Beach on Saturday, December 31, 2011. Doors open at 8:30 p.m. Show starts at 9:30 p.m. Tickets are now available by visiting ticketmaster.com. Our music hall is a no smoking facility. This show is for all ages subject to parental discretion. (843) 272-3000. 4640 Highway 17 S., N. Myrtle Beach, SC. This entry was posted in Myrtle Beach Golf and tagged Myrtle Beach Golf. Bookmark the permalink.